Earlier this week the Guardian, Forbes and others covered the discovery of 500 fairy tales collected by 19th century folklorist Franz Xaver von Schönwerth. I sent a note about this to Professor Jack Zipes, who promptly replied urging caution about the discovery and pointing to many other (in his view more interesting) 19th century collections from France and Germany. An expanded version of his note is now up on the website for the Sussex Centre for Folklore, Fairy Tales and Fantasy. I have only read Schönwerth’s tales from the earlier three volumes, and they range from boring to good examples of Bavarian customs. Nothing to get excited about, just as there is nothing to get excited about in the more recent example provided in The Guardian. I can point to some brilliant German collections by Theodor Vernaleken, Johann Wilhelm Wolf, Ignaz and Joseph Zingerele, Heinrich Pröhle, Josef Haltrich, Christian Schneller, Karl Haupt, Hermann Knust, Carl and Theodor Colshorn, etc. etc. and even more brilliant French collections by François-Marie Luzel, Paul Sébillot, Emmanuel Cosquin, Jean-François Bladé, Henry Carnoy, etc. etc. that contain tales fastidiously recorded by these folklorists, who translated them from dialect versions. They also include raw dialect versions with their translations. There is also the question of artistic value. Many of the European folklorists like the Grimms, had a great artistic sensibility. The artistic power of the Grimms’ tales and other collections can be experienced when they are read aloud. I believe that the best folklorists always had to “translate” and “adapt” the tales they collected, and they did this while trying to remain true to the spoken word. So, you can praise Schönwerth’s “raw” tales, but those that I have read thus far lack an important element of artistic re-creation. He says that “we have not yet translated the best European folk-tale collections into English and given them their due recognition” and that “the general public is not aware that Schönwerth’s work was just a drop in the bucket of folk-tale collecting in Europe during the nineteenth century”. So Iff the Water Genie told Haroun about the Ocean of the Streams of Story, and even though he was full of a sense of hopelessness and failure the magic of the Ocean began to have an effect on Haroun. He looked into the water and saw that it was made up of a thousand thousand thousand and one different currents, each one a different colour, weaving in and out of one another like a liquid tapestry of breathtaking complexity; and Iff explained that these were the Streams of Story, that each coloured strand represented and contained a single tale. Different parts of the Ocean contained different sorts of stories, and as all the stories that had ever been told and as many that were still in the process of being invented could be found here, the Ocean of the Streams of Story was in fact the biggest library in the universe. And because the stories were held here in fluid form, they retained the ability to change, to become new versions of themselves, to join up with other stories and so become yet other stories; so that unlike a library of books, the Ocean of the Streams of Story was much more than a storeroom of yarns. It was not dead but alive. While the Sea of Stories will remain a Platonic fantasy, one can imagine its worldly counterpart in the form of a comprehensive scholarly index of fairy tales and folk tales from around the world. One could explore the index by language, country of origin, date, and author. Perhaps one could explore linkages between early sources and contemporary retellings. Or explore tales by theme or trope, hopefully without falling prey to a Proppian hubris of comprehensive classification and analysis. This is something that I’ve been wanting to pursue for a while as a project tentatively dubbed the ‘Synoptic Folktale Index’ with the Sussex Centre, which was founded by my dad. Several people have expressed support for the idea. Professor D. L. Ashliman has very kindly offered to donate his collection of Folklore and Mythology Electronic Texts to the project, as well as a large private database of bibliographic references. Professor Jack Zipes has given us several big bibliographies of works that he’s used for his own research and publications. The index could be powered by the open source TEXTUS platform, which would enable users to update bibliographies and upload, transcribe and translate texts. The index would enable users to see which tales have and have not been translated, and a translation fund could help to incentivise new translations. In Rushdie’s world, the Sea of Stories is a fertile source for storytellers, whom, if they are brave and “very, very careful, or very, very highly skilled”, can “dip a cup into the Ocean” and “fill it with water from a single, pure Stream of Story” (ibid, p. 72). The protagonist of the book learns that “nothing comes from nothing”, “no story comes from nowhere”, and that “new stories are born from old” (p. 86). This is explained with reference to the digestive systems of “artistic Plentimaw fishes”, who help to generate new tales by combining (parts of) old tales. Many German folklore collectors in the 18th and 19th century believed that folk culture was a fertile soil out of which new works could grow – by retelling, reworking, synthesising and incorporating traditional tales. Johann Gottfried Herder helped to popularise the idea that literary genius could grow out of folk culture – an idea which was fostered by his former teacher Johann Georg Hamann, who was in turn influenced by the vegetative metaphors of English poet Edward Young, who was reacting against what he considered the staid, formalist aesthetic theories of his contemporaries. The paradigmatic case to which German literary theorists after Herder turned was Shakespeare, whose works they believed had grown out of an abundant amalgam of tales, legends, and myths. 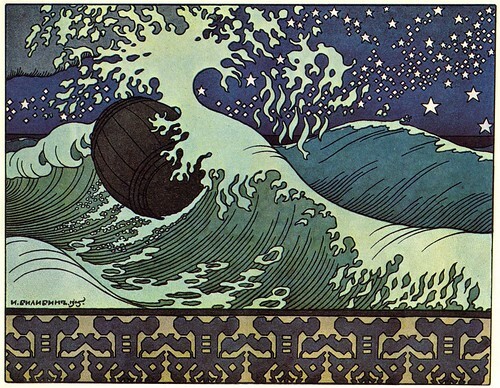 One can envisage that of the many thousands of folk tales that have been collected, some will be of historical interest to those specialist oceanographers who are interested in the subtle inflections and shades of variation in the great waves that roll across the Sea of Stories. But perhaps for the rest of us, the value of a given tale will for the most part be proportional to the talents of the teller. This entry was posted in bibliography, culture, fairytales, hamann, herder, history, humanities, intellectualhistory, literature. Bookmark the permalink. Comments are closed, but you can leave a trackback: Trackback URL.